Just before Game Four of the World Series I happened to walk past a television tuned into the opening ceremonies. It was in a large public viewing area with perhaps fifty people present, most of them strangers to one another. As the last strains of the "Star Spangled Banner" faded away, there wasn't a dry eye in the house. Then Challenger swept out of the night sky and landed on his trainer's wrist. The hush in the room was suffocating, the electricity palpable. All fifty of us were ready to don our camouflage and ship out together on the next flight to Kabul. Birders and non-birders alike immediately recognize and emotionally react to our country's symbol in its adult plumage. But if that huge dark bird doesn't display a white head and tail, misidentification often occurs. I remember assuming, as a beginning birder, any eagle sized bird without a white head and tail was a Golden. This issue's quiz will illustrate field marks which should lay to rest some of those faulty assumptions. Although, this may be the least familiar and least likely to be seen of the three plumages in our quiz, I'm sticking the "easy" label on this photo because it shows the most distinctive field mark of any of our subadult huge birds. There is a lot white on this bird, but for our identification purposes the obvious white axillaries (armpits) are the key, eliminating all but two possibilities immature Bald Eagle and California Condor. All Golden Eagles have dark armpits. Neither juvenile nor adult condors will show this white splotching on the belly and flight feathers. And condors won't look like huge dark birds. Half again larger than Bald Eagles, condors look like small airplanes. In their first three plumages, subadult Bald Eagles have white axillaries. Typically it takes four years for Bald Eagles to acquire the full adult plumage that triggers our adrenaline. The four subadult age classes are labeled Juvenile, Basic I, Basic II, and Basic III. Basic III birds with their whitish heads and mostly white tails would be recognizable to non-birders. In flight they will not show white axillaries. After we've noted the white armpits, the second most obvious field mark on our quiz bird is the one which eliminates two of the remaining three age classes for us. Not that the trailing edge of the visible wing appears very ragged. When Bald Eagles undergo their first molt, some but not all flight feathers are replaced. Retained secondaries (inner flight feathers) are longer and more pointed, new ones shorter with blunter tips creating the uneven effect. Bald Eagles have 14 secondaries numbered from the outside in. Our photo shows S1, S5, S12-14 to be new, S2-4 and S611 to be longer juvenile feathers. Several of this bird's primaries (outer flight feathers) also appear very tattered. 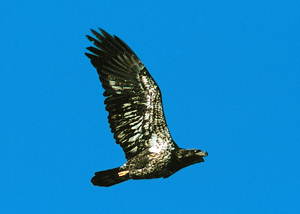 Juvenile Bald Eagles, having not undergone a molt, will display a straight, smooth trailing wing line in flight. By Basic II, secondary molt will be complete and the trailing edge will again be uniform. Occasionally a juvenile secondary or the outermost primaries will be retained in Basic II plumage. This Basic I Bald Eagle was photographed in Brackendale, British Columbia in December, 1999. Because underwing shape and color are often so diagnostic, many raptors are more easily identified in flight than perched, especially at a distance. With this close-up through, we have a good look at head features and body plumage. The head is feathered but it's not white. This eliminates the vultures, adult Bald Eagle, and Osprey. The real difficulty for us is deciding whether or not our second bird is a Golden Eagle. Golden Eagle cannot be dismissed just because of the head and nape for which this species is named is more often than not obscured by the bird's posture or the angle of light, making the bird appear uniformly dark as it does in this photo. We need to focus here on a couple other features - bill size and body plumage. Our photo birds has a massive bill with a lethal looking hook. Which is harder to rip open, the tough scales on a fish or the soft skin of a rodent? Though Balds and Goldens are essentially the same size, with just a little practice the thicker, heavier bill of Bald Eagles is easily recognizable, and it adds to the species' imperious head profile. Additionally, the bill on Goldens in all plumages will have three distinct colors: horn lores (base of the bill in front of the eye); yellow cere (bare skin around the nostrils); and black tip/ the huge bill in our photo is uniformly dark, cere and tip the same color. Corroborating evidence against Golden Eagle is the white mottling on the wing and tail coverts and on the flanks and outer breast. Only rarely will Goldens show white feathering on the body. This young Bald Eagle was photographed on the Samish Flats in Washington State in January 2001. Because it has no with mottling on the belly and no hint of yellow around the nares (nostrils), we can be fairly certain it is in Juvenile Plumage are the dark crown and dark gray beak, both of which begin to lighten by the time Basic I plumage is attained. On our bird we can be fairly certain it is in Juvenile plumage. Other characteristics of this plumage are the dark crown and dark gray beak, both of which begin to lighten by the time Basic I plumage is attained. On our bird we can see just a hint of buff growing into the crown. In Basic I both crown and cheeks will be buffy and by Basic II these areas will be turning to white with a distinct eyeline between them. Though this bird appears the same size in the frame as our first bird, this photo is not nearly as sharp or well exposed. It perfectly illustrates on of the flight shooter's biggest problems - birds on the wing are often between the sun and the lens. In order to illuminate the diagnostic but deeply shadowed underwing pattern, this shot was overexposed, sacrificing detail and blowing out the head and nape area. Additionally, the grain and softer focus here tell us this bird was actually much farther away than the first. The Dark underside of this bird is marked by three large patches of white. Two are at the bases of the primaries, one at the base of the tail extending all the way to its outer margins. The tail's dark terminal band is very wide. The axillaries are dark. This pattern is quite distinctive and quite diagnostic. 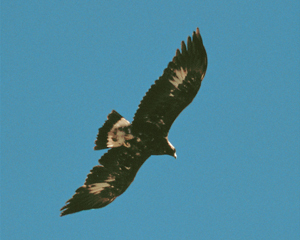 This is a classic look at an immature Golden Eagle, photographed in the Ruby Mountains of Nevada in August, 1994. Note the ragged trailing edges of the wing which indicate a subadult bird, and the apparent golden nape which Goldens of all ages will show. Golden Eagles are more closely related to the butoes than to Bald Eagles, and a hint of this relationship is apparent in the shape and curvature of the wing. Relative to Balds, Goldens' wings will appear longer but narrower, more indented near the body with more bulging secondaries. In flight Goldens typically glide on flat wings, whereas Balds often glide with wings bowed downward resembling an Osprey. There are arguments that Golden Eagle, hunter rather than scavenger and more widespread over the country, would be a more appropriate national symbol, but the visceral response evoked by that distinctive white head has certainly bonded us in these uncertain times. To best see and study our country's emblem in its subadult plumages spend a weekend this winter driving roads around Lake Mary and Mormon Lake southeast of Flagstaff when and where the eagles hold their annual retreat.